I had been planning to make this bread for a very long time and finally made it yesterday and the results were purely tasty. The bread looks really nice when out of the oven. This is an Arabic sweet bread with a sugar and honey glaze on top which I skipped but I am including that too in the recipe. 1. First prepare the glaze if using. 2. Take sugar, water and saffron in a saucepan and boil till it slightly thickens. 3. Turn off heat and add honey after removing from heat. 4. Mix and allow it to cool completely. 5. Now start preparing the dough. 6. To a mixing bowl add the flour, milk powder, yeast, sugar, salt and mix well. 7. Add the oil, butter and egg and mix well. 8. Now start adding warm milk little by little and knead the dough. If the all the milk is used up then add water. Remember that both milk and then water should be warm. Not hot or cold. 9. knead for 8-10 minutes to form a soft dough. 10. Apply oil on fingers and apply all over the dough. Place it in bowl and cover with cling wrap or a damp kitchen cloth. 11. Leave it in a warm place for an hour to double in size. I place it in the microwave along with a bowl of boiling water. Ensure that the microwave is turned off. 12. After an hour, punch down the dough. 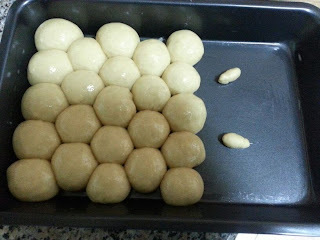 Divide it into small balls, I got about 23 small balls. 13. Take each ball, roll between your palms well. Stretch it using your fingers and place a small piece of cheese in the center. 14. Bring the sides together at the center to seal the cheese completely and form a ball again. 16. Repeat this with all the dough balls. 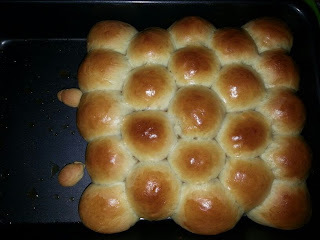 Place the dough balls as close as possible to one another and form a honeycomb pattern. 17. I used a rectangular pan so placed 5-4-5-4-5 and then two small bees. 18. Cover and place aside for a second rise for about 30 minutes. 20. Apply egg wash on the dough balls. Use the remaining egg and beat it with 1 teaspoon of milk to prepare egg wash.
21. Bake it in the oven at 180C for 20-25 minutes or till the tops are golden. 22. Remove from the oven, place on a cooling rack and pour the glaze on top spreading evenly. You can even brush the syrup. I skipped this. The buns should be hot and syrup should be cool. 23. 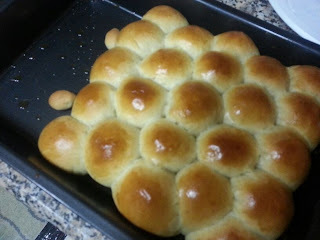 Let the honeycomb bread cool down for a few minutes. 1. Cheese can be replaced with chocolate.